For all of its faults during the time of empire, the United Kingdom used to be a thriving hotbed of intellectualism. Not only was the United Kingdom the driver of the industrial revolution, it was also a land of rapid intellectual, scientific and political development. These days, as the standard of public debate continues sinking to every more dispiriting lows, I think it's worth looking back and considering how the hell have things gone so wrong. Its obviously an over-simplification to start at any arbitrary point, but we must start somewhere, so the rise of liberalism in the 17th Century seems as good a point as any. It was from this period onward that the persecution of non-conformism declined dramatically. In the 17th Century the philosophers Thomas Hobbes and John Locke established the concepts of the social contract and natural rights that gradually eroded the tyranny of the monarcy-state-church nexus. The English Civil War resulted in the fall of the monarchy, but the powerful political elites who took the place of the monarchy imprisoned and marginalised radicals like John Lilburne ("Freeborn John") and the Levellers to prevent an egalitarian reformation of British society. Despite these efforts by the powerful elites to stamp out political and religious radicalism by persecuting non-conformists like the Levellers, Seekers, Quakers and the Diggers, the unstoppable trend towards liberalism and tolerance of of religious non-conformism had been set in motion. It was never the case that persecution of non-conformity was eliminated entirely, but from the late 17th Century onwards the people of Great Britain found ever more freedom to express non-conformist political views, and to practice whichever religion they liked, or none at all for that matter. Another visionary liberal philosopher to spring up in 17th Century Britain was to inspire the independence revolution in the United States. Thomas Paine's revolutionary essays inspired the movement that excised the monarchy-state-church nexus from vast territories of North America. The vestiges of the tyrannical monarchy-state-church nexus persist in Britain to this day. The UK state is an anachronism with its monarch serving as joint head of state and head of the established church, its antiquated and unrepresentative electoral system and its unelected religious clerics in its bloated and entirely unelected House of Lords. However the power of the state to silence, imprison and execute critics of the establishment order has been gradually eroded, such that we can publish our republican sentiments, our anti-establishment political views and our non-conformist theological thoughts with little fear of being economically sanctioned, imprisoned or garotted by the monarchy-state-church nexus for airing such views. The 19th Century wasn't just the heyday of the industrial revolution, it was an age of rapid public enlightenment and social progress: Libraries, educational institutions and museums sprang up all over the nation; education and basic literacy gradually became the norm rather than the privileges of the wealthy; and barbaric practices like slavery and child labour were abolished. Against this backdrop of rising standards in literacy and freedom from oppression, Britain played host to an extraordinary array of political movements. Liberals, anarchists, religious non-conformists, Owenites, socialists, communists, libertarians, laissez-faire capitalists, free-thinkers, mutualists and syndicalists all competed for attention from an increasingly literate population. Non-conformists and hetorodox political thinkers had a much more difficult time on the continent. A look at the lives of many of the most interesting European political thinkers of the age (Proudhon, Bakunin, Michel, Galleani, Malatesta, Blanqui ...) reveal lives interrupted by prolonged periods of imprisonment and exile. Britain was not free of political persecution by any stretch of the imagination, however the more liberal environment meant that London became a safe haven for all kinds of heterodox political thinkers including Marx, Engels, Herzen, Mazzini, Kossuth and Kropotkin. In response to a furious letter from the Spanish embassy decrying Britain for harbouring political exiles in 1871 the British government declared that "all foreigners have an absolute right to enter the country and remain", and that they have the same right as British citizens to be "punished only for offences against the law". The growing tolerance of unorthodox political and religious thought in the United Kingdom led to the rise of countless public intellectuals, many of whom worked to educate the public through the publication of essays and literature and were deeply involved in the political affairs of their age. It's impossible to provide a definitive list of 19th Century public intellectuals, however naming just a few high profile individuals from the period goes to show how intellectuals were held in high public regard: John Stuart Mill, William Morris, George Holyoake, Alfred Russel Wallace, Charles Darwin, Thomas Henry Huxley, Francis Galton, Herbert Spencer, Alfred Marshall, Alexander Graham Bell. Who are the great British public intellectuals, philosophers and political theorists of the 21st Century? There are obviously a great deal of very intelligent people in Britain, who could rightly be considered public intellectuals, however, it seems to me that very few of them have a large enough public profile that they would be recognisable to the majority of people. Tim Berners-Lee deserves enormous credit for inventing the World Wide Web, but how many people could tell you what he was famous for just from hearing his name or seeing his photograph? The same goes for a number of other modern day intellectuals. What percentage of the general public could even identify the likes of Robert Skidelsky, Ian McEwan, Martin Amis, Tariq Ali, Susie Orbach, AC Grayling, Andrew Motion, Alan Bennett, Mary Beard or Roger Penrose? The only high profile public intellectual I'm completely confident that the majority of British people could identify is Stephen Hawking. When it comes to politics the situation is utterly embarrassing. When a revisionist halfwit like Michael Gove is considered to be one of the great intellectuals of the Tory party, and a the likes of Tristram Hunt and Gordon Brown are lauded as the great intellectuals of the Labour Party we know that we're in trouble. The United Kingdom has turned from a country that celebrated intellectualism to one that treats it with suspicion and contempt, especially if intellectuals (these days so often prefaced with "so-called" by the tabloid press) dare to voice a political opinion that goes against the established orthodoxy. 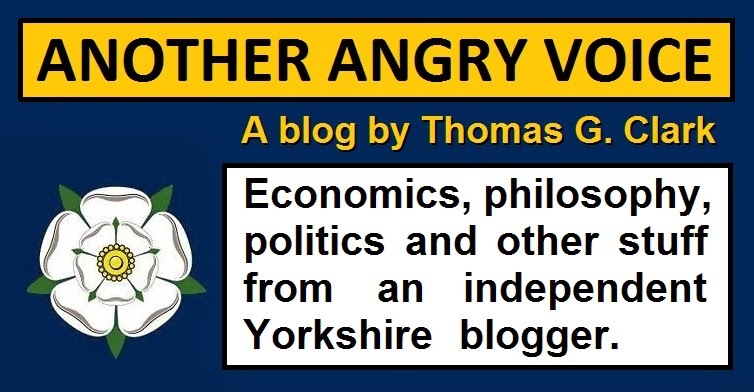 When people speak out against the right-wing economic orthodoxy that has dominated UK politics for almost four decades, they are hounded by the tabloid press. In my view an awful lot of public intellectuals are afraid to speak out against the right-wing economic orthodoxy for fear of the abuse they'll suffer from the right-wing press. The hounding of public figures who speak out against the orthodoxy is not the only way in which the tabloid press helps to control public debate. Newspapers like The Sun and The Daily Mail are deliberately written in the vocabulary of children in order to make their glib right-wing political tropes accessible to even the least intelligent adults. It's not just conjecture that the tabloid newspapers have contributed to the stupification of the British public either. Research has shown that reading a tabloid newspaper is worse for your vocabulary than not reading a newspaper at all, and that "the presence of tabloid newspapers in the home during childhood has been linked to poor cognitive attainment at age 16". It's not just the tabloids that are to blame. Generations of politicians have turned the UK education system into an absolute shambles, where children who attend state schools are denied the absolute basics in critical thinking, philosophy and economics and taught that correct answers are handed down to them by authority to be uncritically rote learned and regurgitated upon demand in order to obtain rewards in the form of grades. It obviously makes no sense for the establishment to teach future generations critical thinking skills and basic macroeconomics, otherwise they'd grow up to ask questions and find out that their own rational self-interest is not best served through continued support for an out-of-touch establishment minority that is clearly intent on hoarding political power for their own class and enacting ideologically driven economic policies that enrich the already rich at the expense of everyone else. The standard of political debate in the UK continues suffering a steep decline. People seem to no longer even understand the meanings of fundamental political words and phrases. Terms like "communism", "anarchism", "liberalism" and "socialism" have been weaponised, so that simply calling somebody a "communist" is somehow considered sufficient to discredit their entire position, without any obligation for the term communist to even be understood, let alone it be demonstrated that the accused actually subscribes to any of the numerous communist ideologies. We live in a world where hurling words like "communist" around as if they're crude insults rather than political words with specific meanings or publishing pictures of the opposition leader looking odd while he eats a bacon sandwich are considered dynamite by the political right. Meanwhile many on the left seem to think that simply calling David Cameron a "pigfucker" (instead of criticising any of the countless socially and economically destructive policies Cameron's government have inflicted on the UK) is a debate winning tactic, rather than the kind of crude unsubstantiated assertion that makes the left look like a bunch of ranting extremists. The rise of someone like David Cameron was pretty much inevitable given the stupification of the electorate. Cameron has proven himself an egregious liar, an abuser of the English language, a snide and manipulative person who refuses to answer direct questions or act in good faith and a coward who is terrified of having to think on his feet (hence his refusals to participate in unscripted public debates). However, despite all of this evidence that David Cameron is a fundamentally dishonest charlatan and clearly the least intellectually capable Prime Minister in living memory, somehow over 11 million people saw fit to actually vote in favour of keeping him in power! It doesn't matter whether you agreed with the likes of Benjamin Disreali, John Stuart Mill, Winston Churchill, William Beveridge or Clement Attlee, it's pretty much impossible to argue that they were stupid people who just read out a load of scripted nonsense and ran away from any form of actual debate. These were intelligent men of principle who knew what they were talking about and were unafraid of open honest debate. I'm not Tory but I'm pretty damned sure that the likes of Disreali and Churchill would be utterly appalled that the Conservative party is now being led by such an intellectually stunted, snide and downright dishonest chancer like David Cameron. 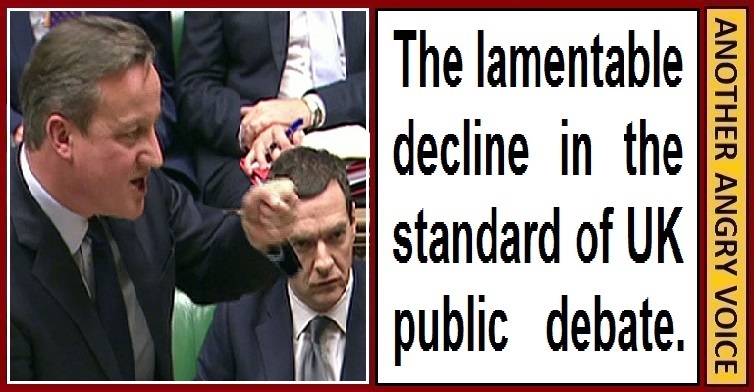 It seems that little can actually be done as long as the parliamentary authorities allow David Cameron to continue repeatedly evading questions and blatantly lying to parliament, and as long as the mainstream media refuse to hold David Cameron and the Tories to account for their litany of lies and broken promises to the public. David Cameron can sign a "contract with the electorate" then simply have every trace of it deleted from the Tory website when it became clear that they'd broken nearly every pledge it contained; he can lie to parliament that the UK has been "bankrupted"; he can lie to the public that the Tories are reducing the national debt (when they've actually created more new debt since 2010 than every Labour government in history combined); he can use all kinds of Orwellian language to claim that black is white and white is black; and he can lie over and over and over again about the leader of the opposition. He can do all of this and get away with it because virtually nobody holds him to account for it. Even if David Cameron is removed from power, if the means to lie, distort, adopt bad faith positions and spout logical fallacies remains so desperately unchallenged, his successors would be fools to limit themselves to honest, good faith debate. 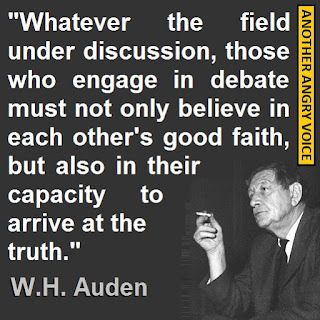 The poet WH Auden once wrote that "Whatever the field under discussion, those who engage in debate must not only believe in each other's good faith, but also in their capacity to arrive at the truth". Surely nobody believes that it's possible to engage in this kind of honest debate with the likes of David Cameron? Surely nobody believes that David Cameron would voluntarily stick to the truth, argue in good faith or answer direct questions (rather than repeatedly evade them with a load of heavily scripted and largely inaccurate tabloid style rhetoric and snide political point scoring). 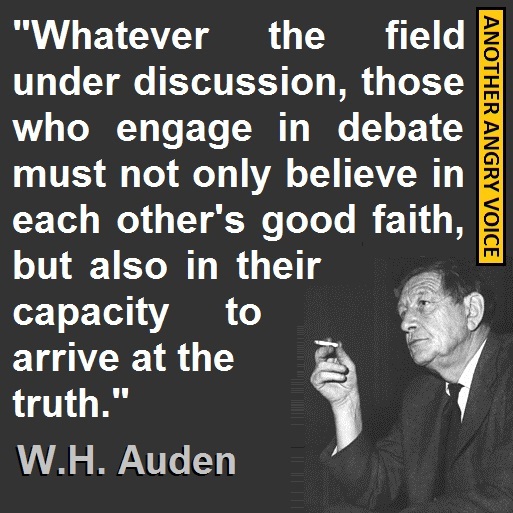 Unfortunately, until the public begin to demand a higher level of public debate from their politicians, any politician who does try to adopt the traditional British form of debate (by limiting themselves to avoiding lies and smears, arguing in good faith and actually answering the questions they're asked) would be voluntarily tying their hands behind their back while allowing other less scrupulous politicians to repeatedly punch them below the belt to cheers of delight from the tabloid-minded masses. 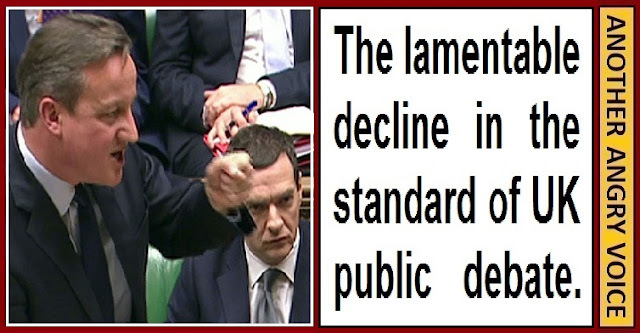 How depraved is David Cameron?